Huawei is reportedly going to launch a flagship smartphone at an event in March in Paris. The smartphone is suggested to be a flagship from the P20 series. Recently, we came across lots of renders of these smartphones with the model number being EML-AL00 and EML-TL00. These smartphones have been listed on TENAA in China and according to the rumors, these smartphones could be part of the P20 series. The renders show a full black front panel with 18:9 display with a home button below the display. The fingerprint sensor has been integrated with the home button because the fingerprint sensor is not found elsewhere on the phone. 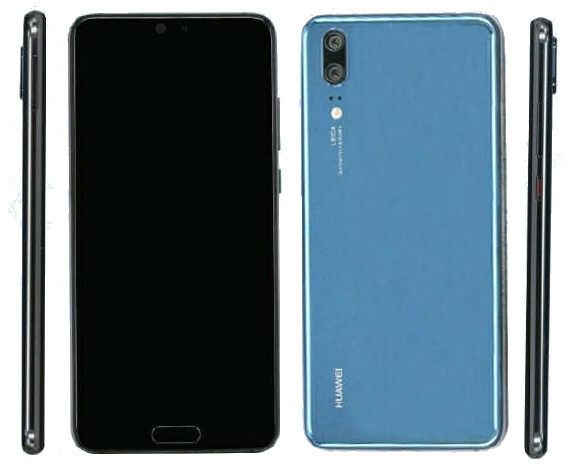 The back of the phone seems to be covered with glass and Huawei has used a vertical arrangement of the dual camera setup with flash. The camera is from Leica, and it is probable because Huawei has used LEICA cameras in its smartphones before. Some rumors have also suggested that the Huawei P10 Plus will be featuring triple camera setup at the back. According to the rumors, the smartphone will be running Android 8.1 Oreo with the EMUI 8.1 layered on the top. Both of the smartphones are expected to sport a Kirin 970 SoC. Huawei is also expected to launch a new range of tablet in MediaPad tablet series at the MWC 2018 but the smartphones are not expected at the event. The Huawei P20 and P20 Plus smartphones will be the flagship smartphone from the company.